City of Dallas will break ground on a community supported “All-access” playground at Flag Pole Hill that will feature more than slides and swings. The layout of the playground, according to Dallas Park and Recreation officials, will consist of all-inclusive elements that will allow independent play for children and adults of all abilities. The park and recreation department will hosted a ceremony at Flag Pole Hill, near White Rock Lake. Program participants included Dallas City Council member Adam McGough; Robert Abtahi, president, and Robb Stewart, vice president, Dallas Park and Recreation Board; Jordan Spieth Family Foundation guests and representatives from area community organizations. “Playgrounds are for everyone. They are places for interactive enjoyment. As an addition to our park system, Dallas Park and Recreation continues its vision to plan parks and build recreational facilities that benefit Dallas’ diverse communities and create livable neighborhoods,” said Willis C. Winters, director, Dallas Park and Recreation Department. 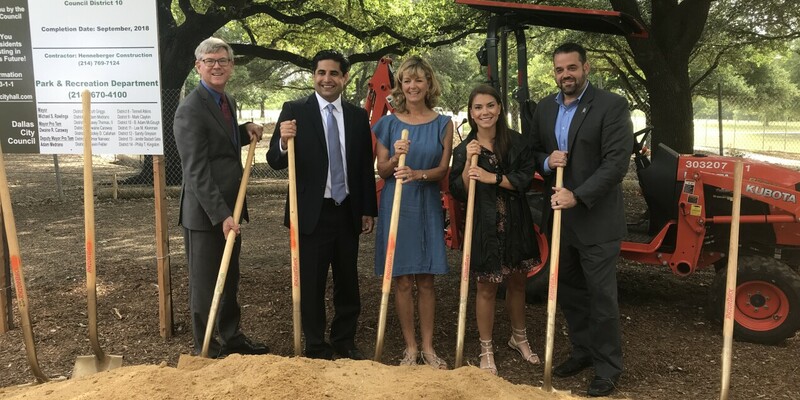 Construction and design of the playground will be paid for through a combination of 2017 bond dollars and generous matching financial support from the Jordan Spieth Family Foundation, the Lake Highlands Junior Women’s League, the Lake Highlands Exchange Club, and the Lake Highlands Women’s League. The idea and initial support for this project was initiated by For The Love of the Lake. The Flag Pole Hill playground project is expected to be completed by mid-September at an approximate cost of $750,000. Additionally, parts of the playground will be constructed beneath trees to provide shade on hot summer days. During numerous community meetings citizens overwhelmingly asked that the beautiful live oak trees be preserved, and the playground design does just that. “The mosaic of different surfaces and textures enhances access for those with mobility issues and inspires children of different ages to play with each other, encouraging learning and cooperation, while at the same time being sensitive to preserving the live oaks,” said Stewart. The Jordan Spieth Family Foundation (JSFF) offers a platform for the PGA Tour Player and 3-time Major Champion to lend time, help grow awareness and offer financial support to four philanthropic areas that mean a great deal to him and his family: youth with special needs, junior golf, military families and pediatric cancer. “The Foundation works alongside many community programs within our mission to help families however we can,” Spieth said. A tangible grant to create something like the inclusive playground at Flag Pole Hill Park is an important symbol for the JSFF – it provides not only access to something unique for the families with special children, but also promotes the message of inclusion and togetherness for children of all abilities and all backgrounds. To see this come to fruition in Dallas, and so close to the Spieth’s childhood home, will be a very special moment for all involved. The JSFF would like to thank the City of Dallas and other project partners for the dedication to seeing this playground become a reality!